(Bloomberg) -- On the hit baking show Nailed It!, flailing contestants can push a red panic button if they’re in trouble and get a couple of minutes with one of the show’s judges. Such a lifeline can help disaster-prone chefs try to resurrect a multitiered aquamarine-colored cake that’s comically disintegrating, for example, or rescue a dessert to which salt has accidentally been added instead of sugar. Jacques Torres is that judge. (The show’s other permanent judge, comedian Nicole Byer, is there to crack jokes, not help.) Before he was a star of the show that celebrates bad cooks, Torres was a storied French pastry chef who created fantastical desserts at New York’s Le Cirque in the 1990s, including a plate-size dark chocolate stove decorated with an oven door and cake pans on the mini-burners. In 2000 he opened the doors to a chocolate factory in Brooklyn, where he started his eponymous company. There, he introduced a line of products that would make Willy Wonka resentful—ranging from life-size chocolate Easter bunnies to hot chocolate so thick you could eat it with a spoon. Now Torres has seven locations around New York, including an experiential museum, and he produces 200 tons of chocolates a year, which are also available by mail order. Valentine’s Day is one of the biggest days of the year for Torres and his team. (But it’s not the busiest one; that’s Christmas). This year, Americans will spend an estimated $1.8 billion on chocolate and candy on Valentine’s Day, according to the convenience store newsletter CSP. That’s an average of about $162 per person, a 13 percent increase from 2018. Torres estimates he’ll use more than 2 tons of chocolate to make 200,000 bonbons for Feb. 14. “And that doesn’t include molded chocolates or wholesale. Maybe it will be around 6 tons,” says Torres, as he leads a tour of the space. This week he invited Bloomberg to check out his 40,000-square-foot factory. It stands in stark contrast to its setting, on the sixth floor of a Brooklyn Army Terminal building that looks like a holdover from 1970s-era Soviet Union. Inside the brightly lit space, vats of melted chocolate swirl. Dozens of shiny dark chocolate truffles roll along an assembly line and fall into trays of cocoa powder; nearby, a white-jacketed worker pipes chocolate into trays with the colorful letters “L,” “O,” “V,” and “E” on the bottom. Torres is here to introduce his new product for the holidays: a series of 25 dark chocolate emoji. Customers can buy a prestocked box, or go into one of his stores and pick the emoji to tell their own story. They come emblazoned with icons that range from tame smiley faces and kisses to risqué eggplants, bananas, and cherries. Less obvious options include tacos and squids. (“They have eight arms,” says Torres, who will find a joke in everything.) He got the idea from his mother-in-law, who texts only in emoji. He’s encouraging cooks to try their hand at making chocolate treats at home for Valentine’s Day. 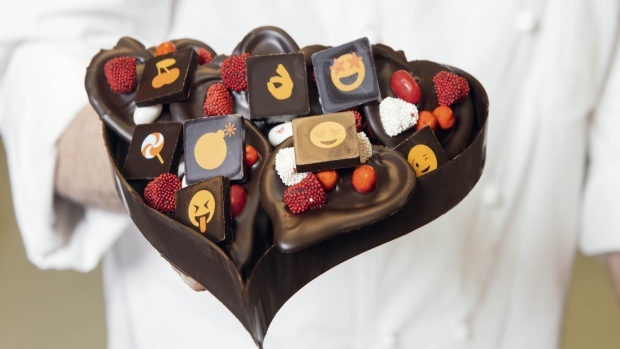 To help, Torres has two recipes: one for simple chocolate hearts (or at least, his version of simple) and one for a more complex chocolate box. Both feature the technique of tempering—chocolate that’s been heated, then cooled, and then heated again so it can harden. It’s easier than it sounds, once you’ve done it once or twice. Point-and-shoot laser thermometers, which you can find on Amazon.com or at Williams Sonoma, transform this from a dreaded project into a thrilling experiment. In any case, if something goes wrong, you can always go to your local chocolatier. And if things go spectacularly wrong, consider it an audition for Nailed It! Put two-thirds of the chocolate in a bowl. Set the bowl over, but not touching, a pan of very hot, just-simmering water and heat the chocolate to 100F, stirring with a rubber spatula. Remove from the pan and stir in the remaining chocolate, then let the melted chocolate cool to 83F-84F; it should harden around the edges. Set the chocolate back over the saucepan of hot water and heat to around 88F. Using a large spoon, drop rounds of the tempered chocolate onto a large piece of parchment paper. Use the tip of the spoon to push the bottom of each round into a slight V shape. Then push out the tops of each round with the spoon to make a rough heart shape. Decorate with colorful candies and refrigerate until hardened. Remove from the paper using a flat spatula, then present to your valentine(s). Makes about 16. Buy a bouquet of flowers wrapped in clear acetate or sturdy plastic. (Or buy a sheet of clear acetate at an art supply or craft store.) Cut a long strip of the paper, about 1 inch wide and 14 inches long. Put two-thirds of the chocolate in a bowl. Set the bowl over a pan of hot water and heat to 105F. Stir in the remaining chocolate and let it melt completely. Spread the silicone strip on parchment paper and brush with the melted chocolate. Using the tip of a sharp knife, trace the outer edges of the strip so the excess chocolate is removed. Pick up the strip and carefully set it upright on the paper, arranging it in the shape of a heart. Spread a layer of chocolate inside the box, spreading it slightly up the sides. Refrigerate until hardened. Use any remaining chocolate to create hearts, as detailed above. Or buy chocolates and candies to fill the box. Present to your valentine(s). Makes one large heart box.